Workshop on “Counter Terrorism Communication and Media Engagement Training” was held on December 17-18, 2014. Workshop on “Attitudinal Changes” was held on November 25-29, 2013. Workshop on “Toolkit for Police Officers” was held on October 22, 2013. 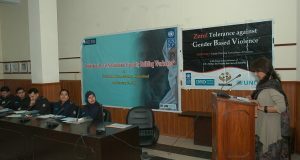 “Institutional Level Sensitisation/Capacity Building Workshop” was held on February 2, 2010.